Dragonfly eggs are laid within their territory near the water. Once hatched, these nymphs will live nearly two years on the bottom of streams and ponds. As they reach adulthood an amazing thing occurs, they transform into dragonflies and ascend to the air. In the air, they travel with wings that sparkle with spectacular colors by reflecting and refracting light and other colors. 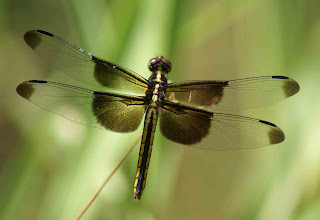 No insect or bird can maneuver as well as a dragonfly. Flying up to 30 mph, they will twist, turn, move up and down, fly backwards, even change directions instantaneously and still will spot movement 40 feet away. The power of Dragonfly lies in its ability to see around things by looking from different angles. Using its ability to transform colors and lights by reflecting and refracting them, Dragonfly shows us that life, like light, can bend, shift, and adapt in various ways, making life's appearance never be what it appears to be. Dragonfly's magic shows us to see through life's illusions and find our true vision. It calls us to transform within our lives and reminds us to feel deeply so we will have the compassion necessary to help ourselves and others. As a creature of the wind, the dragonfly totem represents change. It's iridescent wings are incredibly sensitive to the slightest breeze, and so we are reminded to heed where the proverbial wind blows - lest we run into stormy weather. Dragonflies carry messages that deal with deeper thought - and they ask that we pay attention to our dreams, deeper thoughts and desires. brilliant... I lately was literally followed by dragonflies and intuitively asked myself -what do they mean, what do they want to tell me? I was thinking to check it out on the net -but forgot about it .. I love to be here!!! 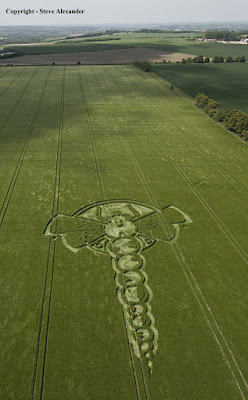 I was serching about crop circles, and arrived here, because I like butterfly and dragon fly... Very interesting the signs, and all these things!... Flying kisses for you! this morning i saw a dragonfly on the patio window of my girlfriend's house. i read this article yesterday! i think it was an incredible sign. thanks for this article BTW. namaste. in lak'ech. love. Today is Wednesday. 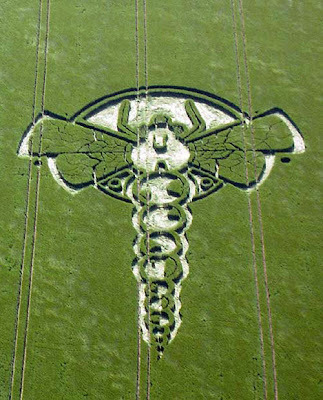 On Sunday night i had a vision of a dragonfly crop circle being cleaned, each circle of it's spinal being cleaning sharpening. 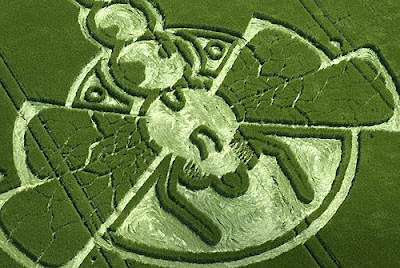 I had seen the butterfly crop design before but did not know there even was a dragonfly one ! All of what you mentioned the dragonfly represents played about in this dreaming sequence- i could suddenly see from all angles and could evaporate my pains and fears- as they existed in a two plane reality and i could approach them from all angles. On Monday i rescued a beautiful yellow spotted dragonfly from a spring fed dam and it buzzed-buzzed-buzzed on a stick i was holding...... and today i found this blog. very cool :) :) :) :) :) things are happening ! Thankyou.